Actress and model, Angelababy (楊穎) attended the opening ceremony and cocktail party of Rob Pruitt for Jimmy Choo capsule collection exhibition held at Pacific Place in Hong Kong on November 14, 2012. 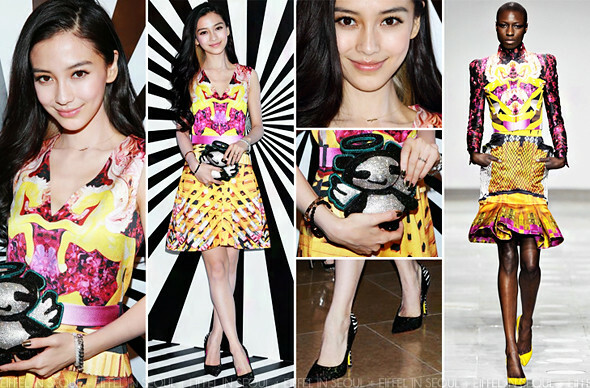 The Hong Kong star wore Mary Katrantzou 'Pencilcage' mirrored horse printed dress from Fall/Winter 2012 collection. She accessorized her look with a pair of 'Anouk' lace-zebra print pumps and the limited edition 'Angel' minaudière from Rob Pruitt for Jimmy Choo collaboration collection. There is only a total of 14 'Angel' minaudière which is hand embellished with 11,000 Swarovski crystals. They retail for a whopping USD$15000.00. What a lucky girl! View the capsule collection on jimmychoo.com.